You can tell Christmas is coming. 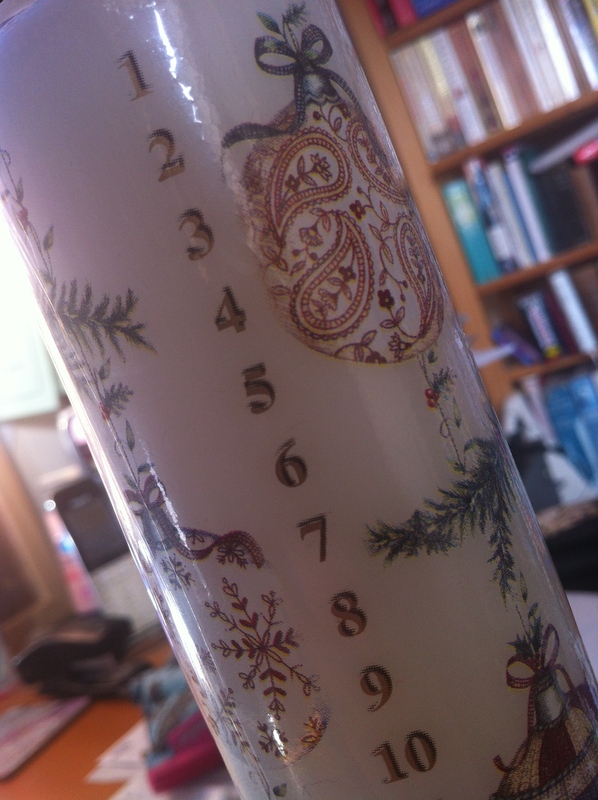 I’ve arrived at that point in Advent where I haven’t blogged about my daily reading for a week, where I caught up with six chocolates from the Advent calendar on Friday night, and where the Advent candle is unlit and still showing 17. And let’s be honest, I haven’t blogged about my daily reading because I haven’t done it. But there is hope for me yet. Maggi writes of the conversation between Mary and Gabriel containing pauses. I like that. I’m not very good at instant conversations – I tend to think of relevant stuff minutes, hours, or even days later; which might be why I like twitter – I can respond a few hours late and no-one seems to mind; and might explain why the friends I love best are those whom I don’t necessarily talk to often, but where I can pick up a conversation without worry or explanation. My experience of God is of lots of pauses, often at the most irritating times – the visual equivalent is a photograph of half a face. But God allows questions too, in these pauses. Clarification, support, strength, understanding. We can ask for them all. We can even ask for a sign – if we are prepared for the consequences. So, however briefly, I have passed today, asked God for a bit of strength, for the right words in the right places to the right people over the coming days. Christmas will come. I went to visit the husband today whose wife died during surgery on Friday. He is devastated and in genuine shock and disbelief. Still expecting his wife to come home or to walk in any minute? There’s was a love match later in life, both in their early fifties when they met and married and we’d been friends of both of theirs for over 20 years – their union was one of love, care and shared joy and Ann, who died was an inspiration to Mick and totally transformed his single life into one where he became a school governor and volunteered for charity and on an NHS foundation, all, interest that they shared jointly. Now, a small heart operation, low risk, has turned out to be high and devastating risk, and he is too shocked to ask the questions why or how but we prayed for him this morning at Holy Communion and I know and felt that he didn’t want prayer with him today, just listening, hugging and talking about Ann and the things that they shared and which we also shared. Fortunately there is family staying with him to help out and friends and neighbours (all in total shock at Ann’s sudden death) and he is so glad to see people, and we are able to cry together (which I admit that I did) and we will mourn together in the next week or so. The questions that I’ve asked myself today are about God’s plan, about the fragility of our life and about the love that comes from God, and that we encounter in each other. And why the Good seem to be taken while the bad seem to thrive? And pertinently, how did minor surgery turn into a death sentence? I’m too emotionally wound up at the moment to consider the answers, but just have had to lay it at the foot of the cross, or I’d not be able to cope, and certainly not be able to support Mick when he asks, and I know that he will. So, Christmas in one household is now on hold, but will have to go on somehow, with pain, sorrow and grief as the backdrop, while we on the margins look into our own hearts and ask ourselves “are we ready to meet our maker just yet” or do we need to do more in Advent to prepare, because you never know when the Creator comes calling.